Before heading out this morning, I stopped by the local vet in Beresford to find out about the timing of Tula’s next blood test. She finished the last of her antibiotics last night, and I wasn’t sure how long to wait to check her Lyme disease levels again. It turned out the local vet hasn’t really dealt too much with Lyme disease, so I simply called Tara’s vet, and they suggested I wait for a couple weeks to let her body get back to normal after the medication. Then it was about a half hour drive straight east to cross back into Iowa, and I had plans to visit a few small towns to walk, and hopefully find a good food donation opportunity since I hadn’t really uncovered much online; other than most of these places seem to be served by the Food Bank of Siouxland down in Sioux City, which was not on my list of towns to visit today. 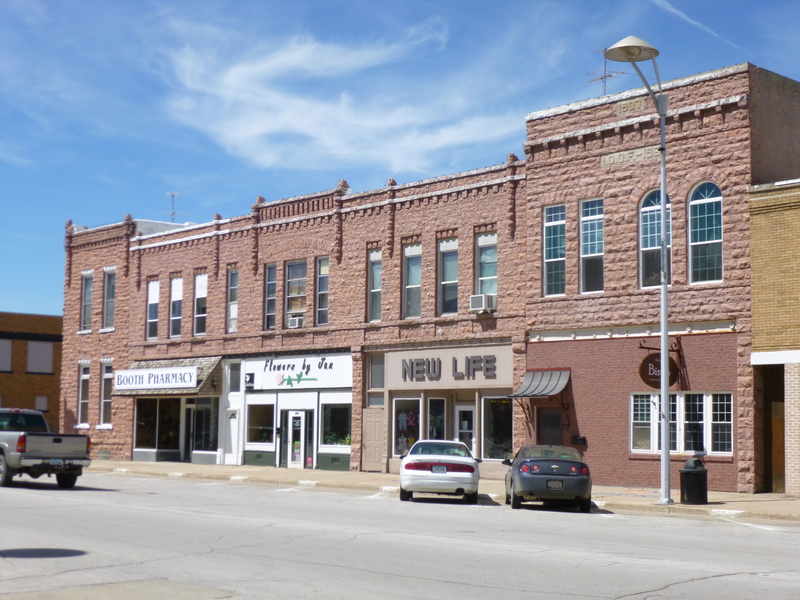 The first Iowa town I came to was Hawarden. I wasn’t really planning to stop there, but I passed a pretty park and figured it would be as good a place to start walking as any! 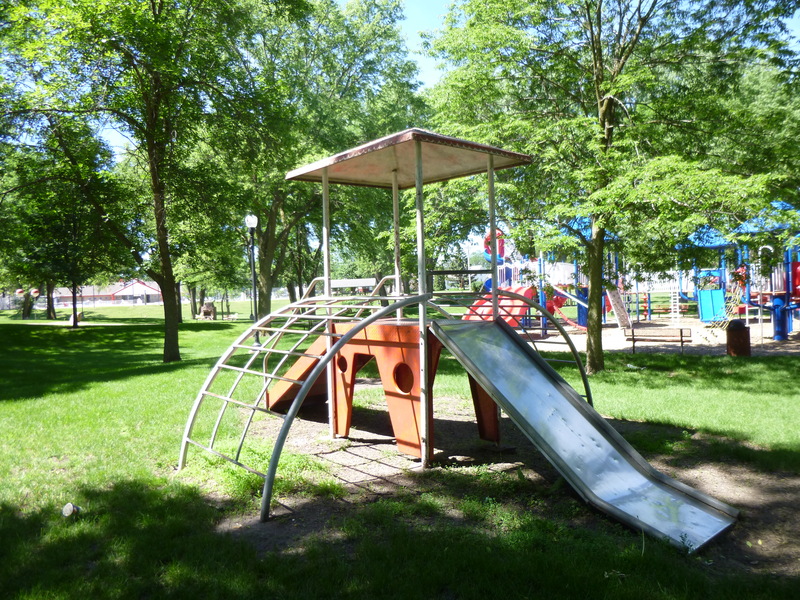 Tula and I set off through the park, and nearly right away I came across some old-style playground toys that transported me back to my youth and lots of time spent in Pembroke Park and Eton Park. I hadn’t seen old metal slides with bumps in them for ages! They stand there and bake in the summer sun and the metal used to get so hot! 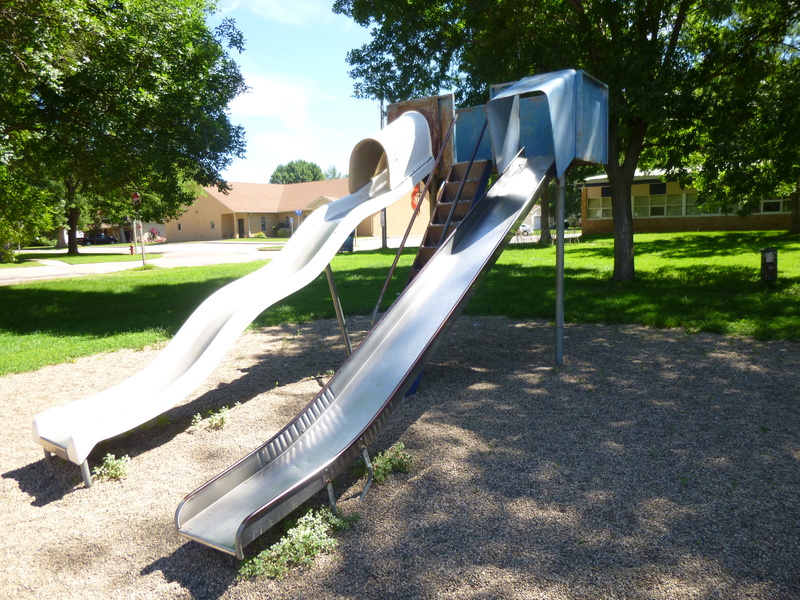 And there was another 4-sided slide/monkey bar sort of thing, with metal steps and metal bars – I don’t know how we played on some of that stuff in summer as kids! 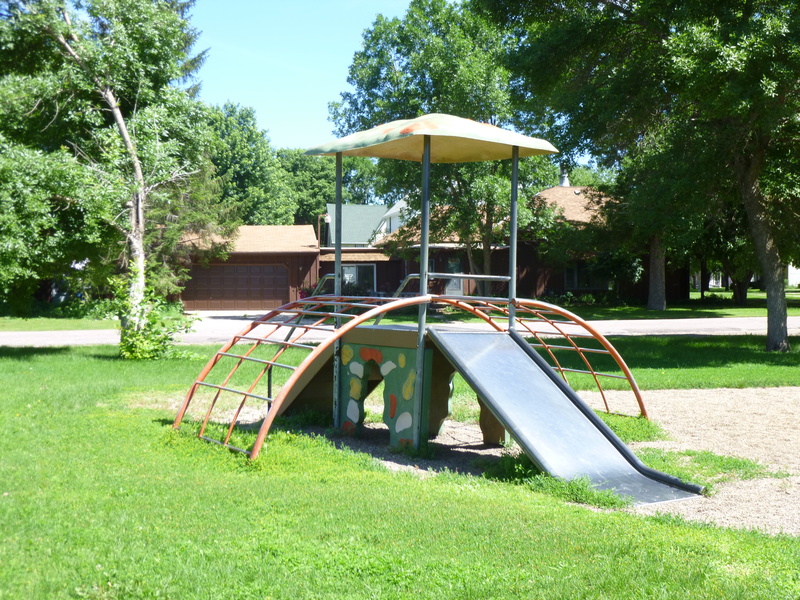 The park did have “modern” playground equipment too, which is where the kids were – it was all colorful and hard plastic so it didn’t get hot. 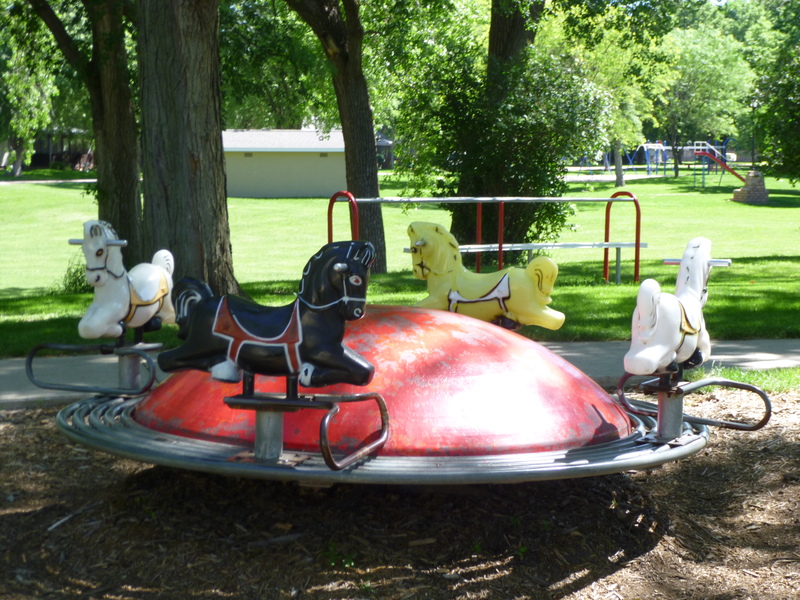 And I’m sure it was much safer than the old-time playground equipment! 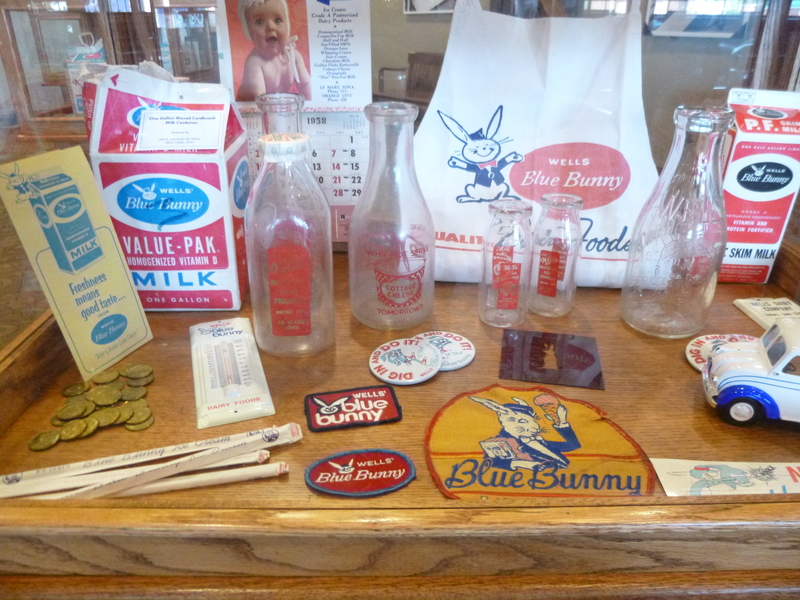 But it was fun to see the other stuff and think about those days! Tula and I walked a couple miles, and then I put her back in the van, and I walked a couple more through town and the neighborhoods. 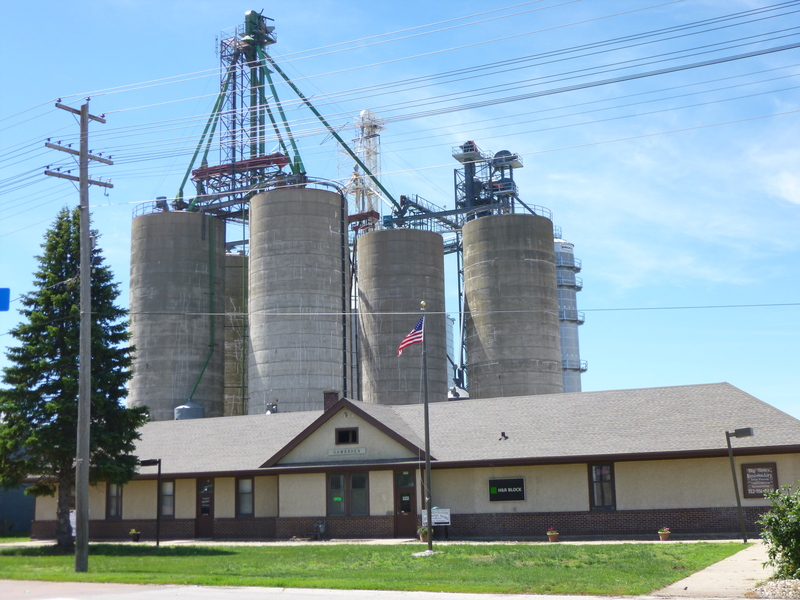 As with most of these small towns, the end of town is anchored by big grain elevators and other agricultural buildings. Altogether I walked 4 1/2 miles in Hawarden. Next up was Orange City, which wasn’t very far away. 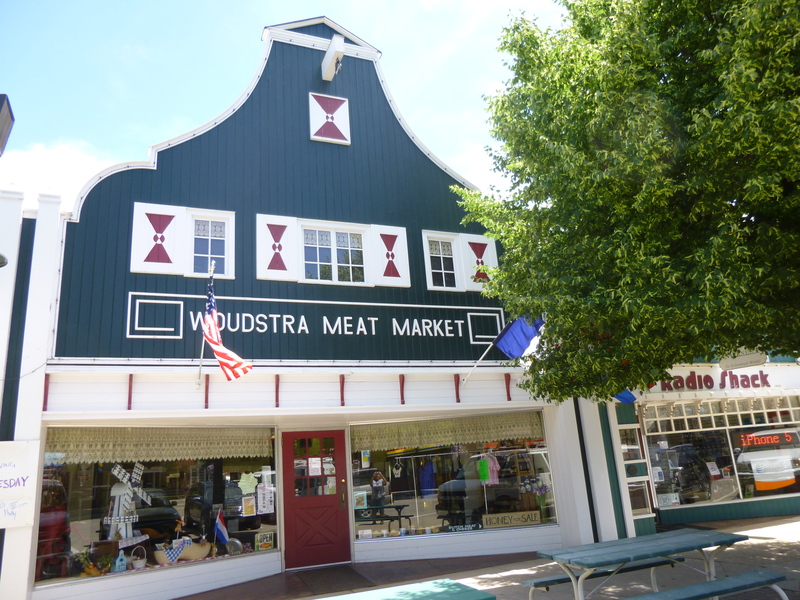 Its visitor center was located in a windmill, and this town has a lot of Dutch history, including a big tulip festival that was held a few weeks ago, and an old wooden shoe factory that is now a different shop. Orange City was a beautiful town for walking, and I spent more than an hour walking through town, seeing Dutch shops and walking through tidy neighborhoods. There’s some kind of tree here with small lily-of-the-valley sized flowers, and they really make the air fragrant – it’s kind of a familiar smell, but I couldn’t place it. 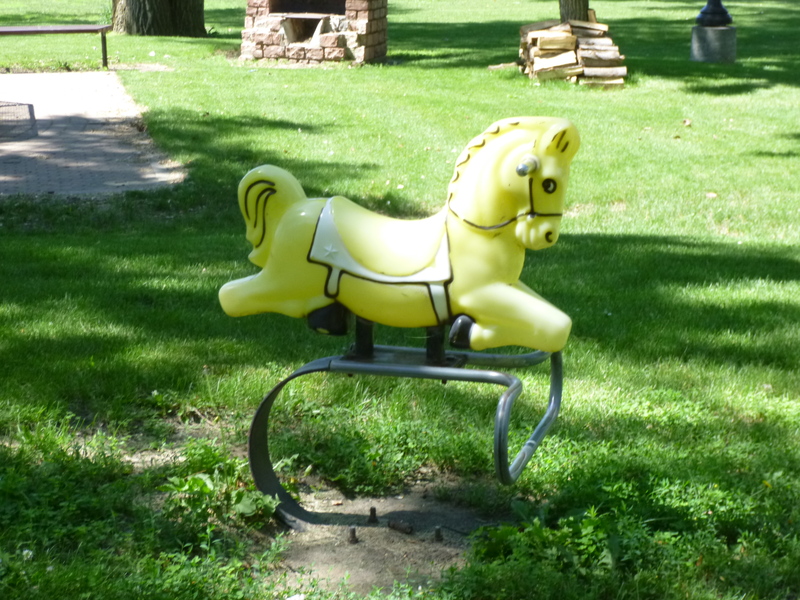 By this time I was starving, and Tula and I took our picnic lunch (leftover chicken and potato salad from last night) into the park, where there was also a display of small scale-model size windmills. I had no idea there were different kinds of windmills for different jobs, and they were used as far back as the 1600s and 1700s. 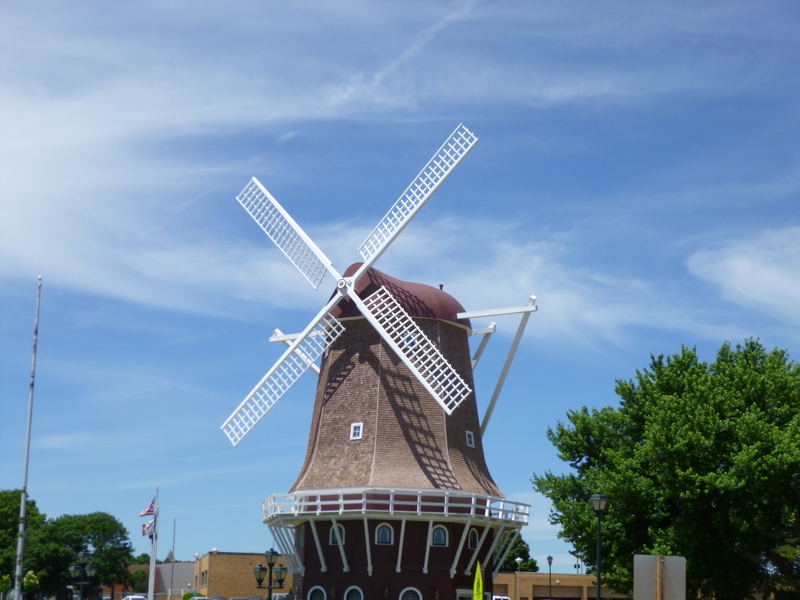 There were windmills for grinding wheat and corn; windmills for sawing lumber; and windmills for draining water (which I didn’t quite understand). 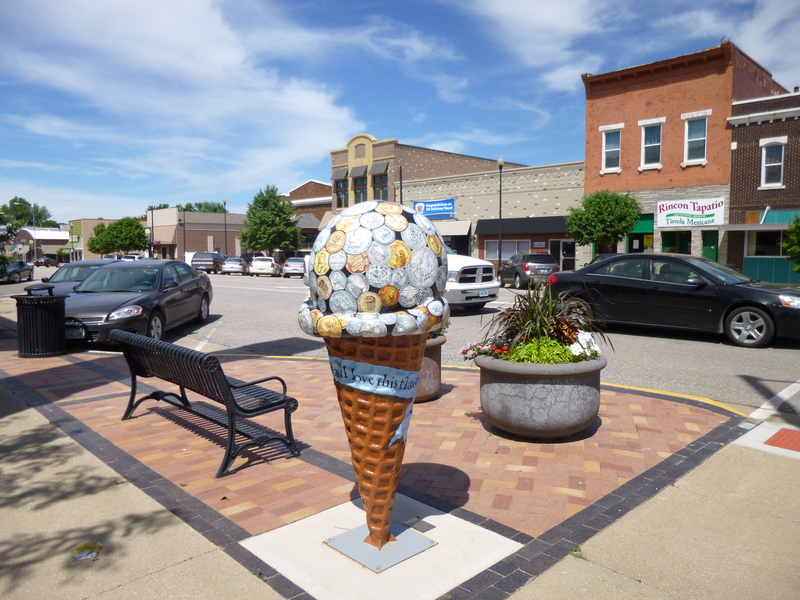 I walked 3 1/4 miles in Orange City. 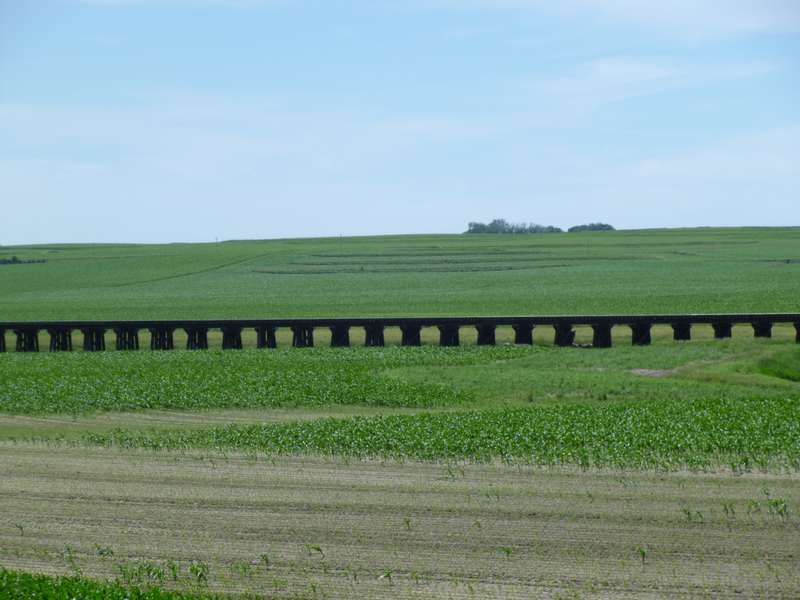 This part of Iowa is beautiful. 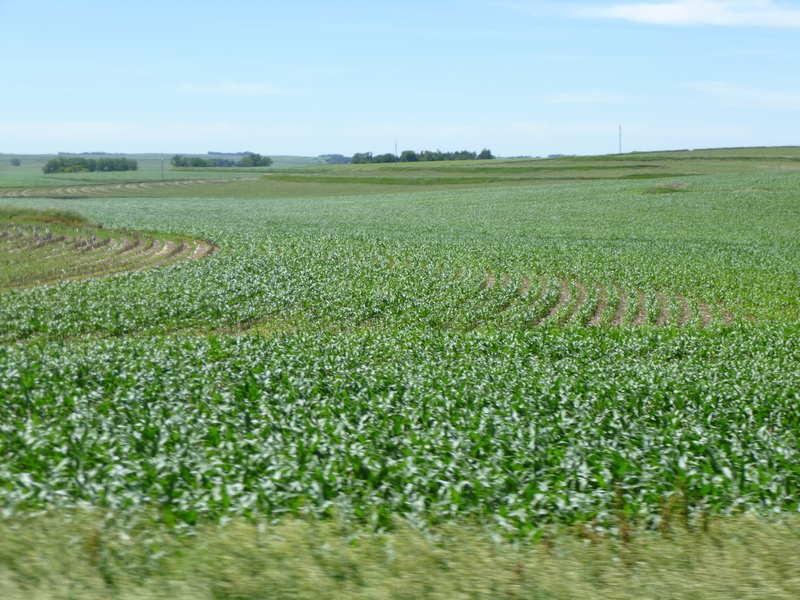 It was a pretty sunny day, and all the land seemed to be green rolling hills – the crops in the fields around here all seemed to be growing abundantly! It was like storybook farm country! 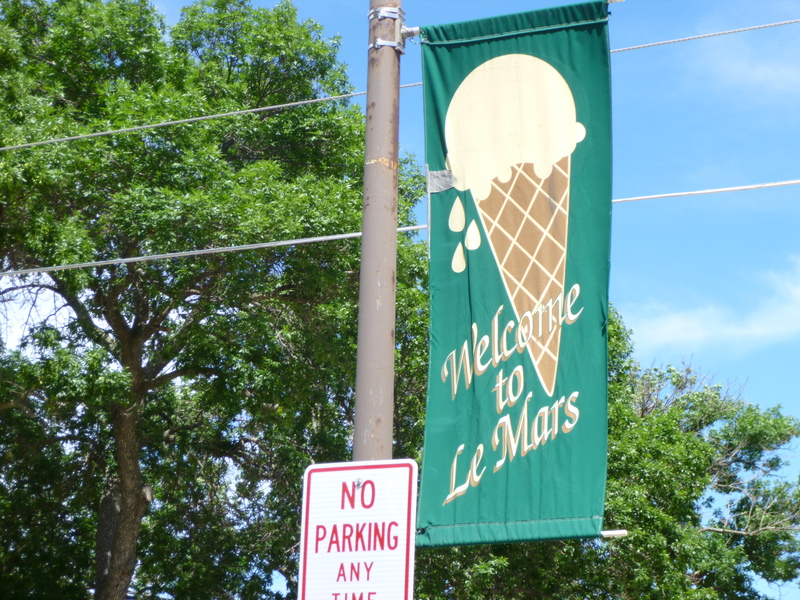 And then I was off to Le Mars – the ice cream capital of the world! 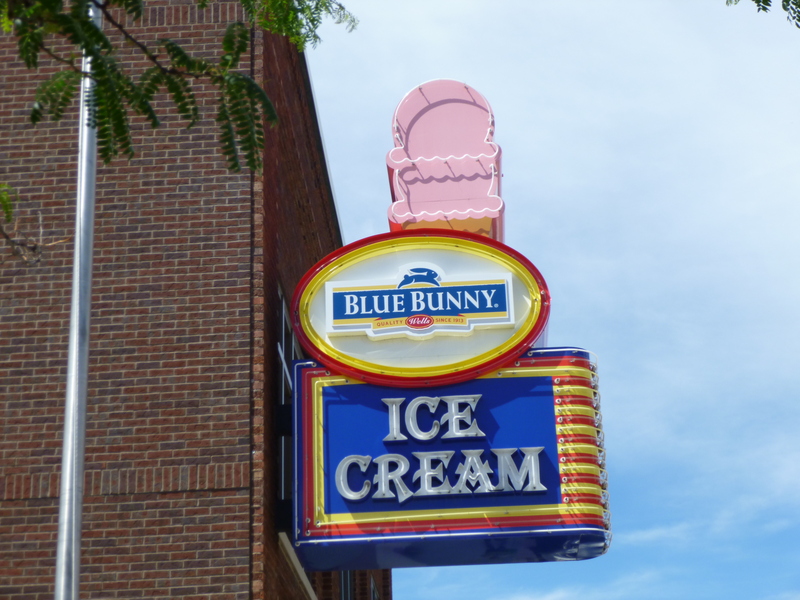 The Blue Bunny ice cream plant is located here, and they produce over 100 million gallons of ice cream a year. I can’t even comprehend how much that is! 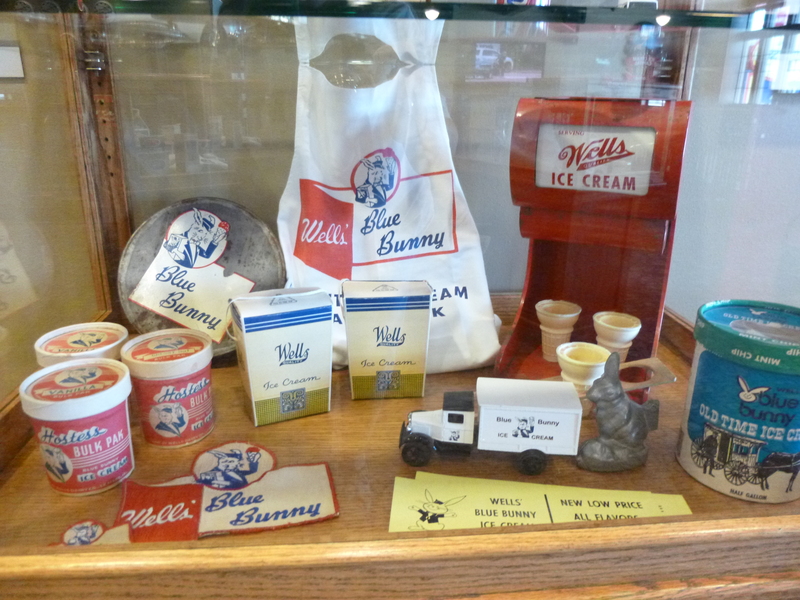 Tours of the dairy are no longer offered for health/sanitary reasons, but of course there was a Blue Bunny ice cream shop in town, complete with small museum and souvenir shop. 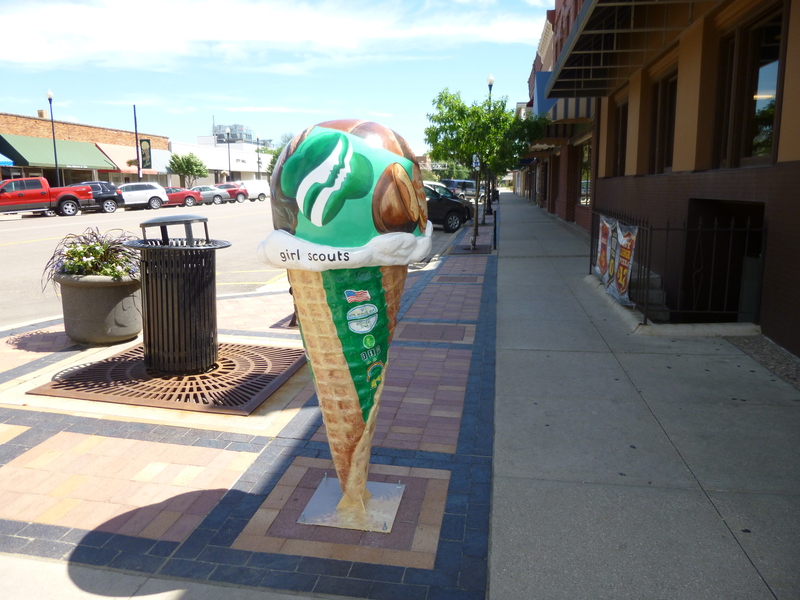 The street corners have ice cream cone statues, painted in different designs by different groups. Tula and I walked over 1 1/2 miles in town and that was my total of 9 1/2 for the day, to make up for my shortfall yesterday. 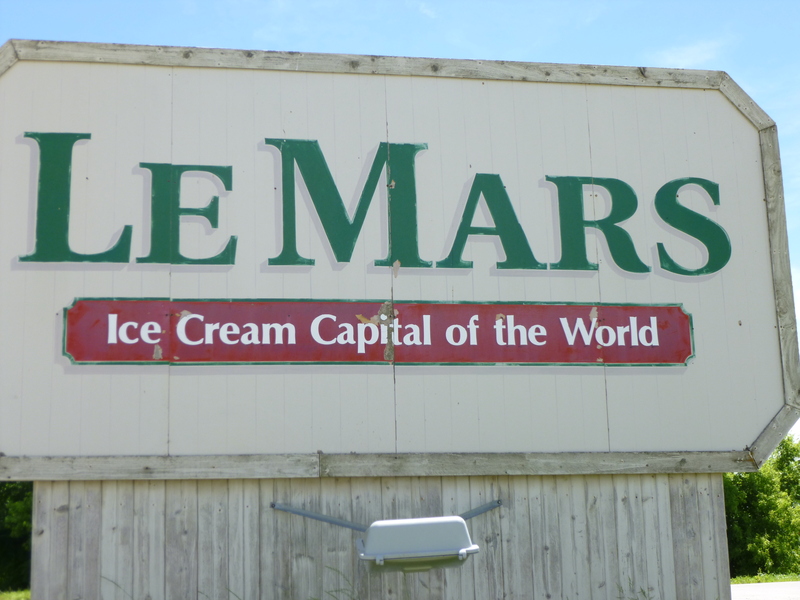 When I was done with the walking, I visited the ice cream shop of course! 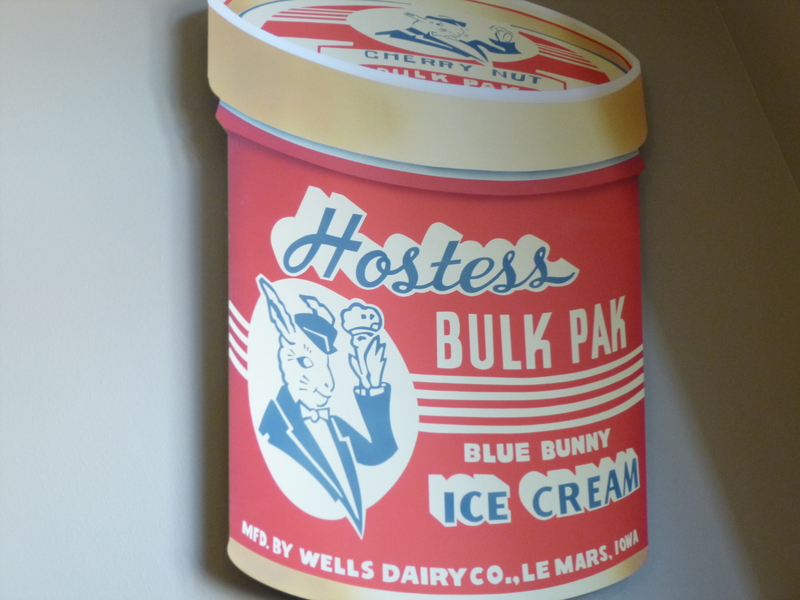 I looked around the museum, and then got one scoop of chocolate chip ice cream (which is getting harder to find – most of it seems to be chocolate chip cookie dough). I thought they made a mistake and gave me a double or triple scoop – their definition of a scoop is huge! But it was very tasty. 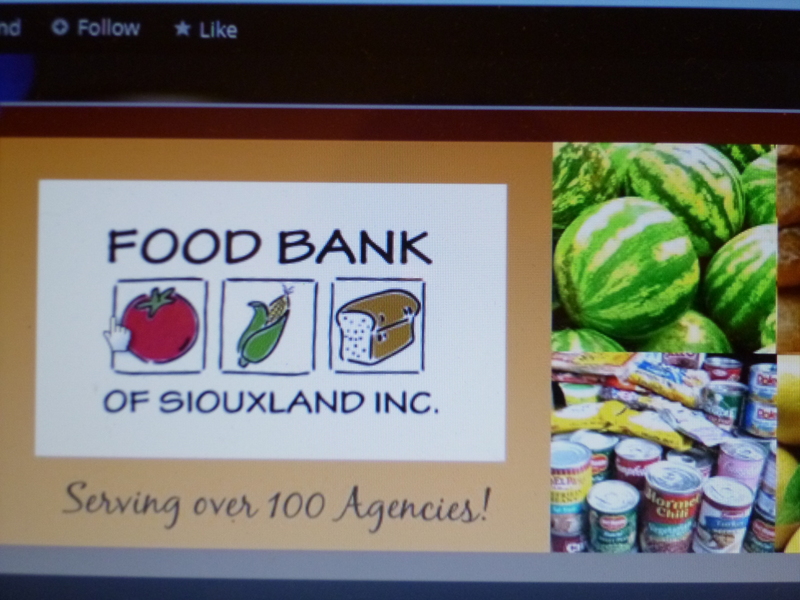 Despite walking all around 3 different towns, nothing popped up as a donation opportunity in this area, so I went back to the website for the Food Bank of Siouxland, and saw that one of their programs is the Mobile Pantry Program, and that’s how they help a lot of these smaller rural towns. I called someone there and left a message, but I never heard anything back, so I simply mailed in a donation to them, along with a note specifying the donation was for the Mobile Pantry, and I told them the towns I visited, so maybe the donation can be used for people in those towns. 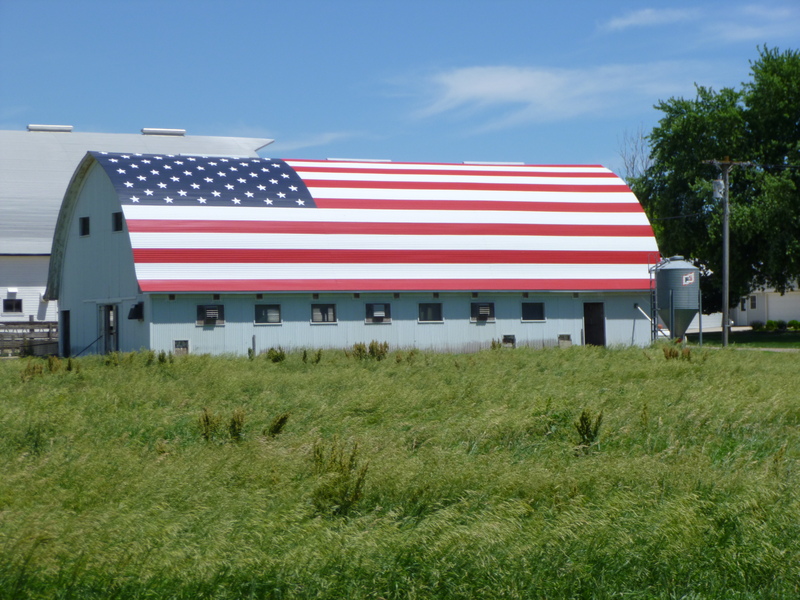 At this point, my time in Iowa was complete. 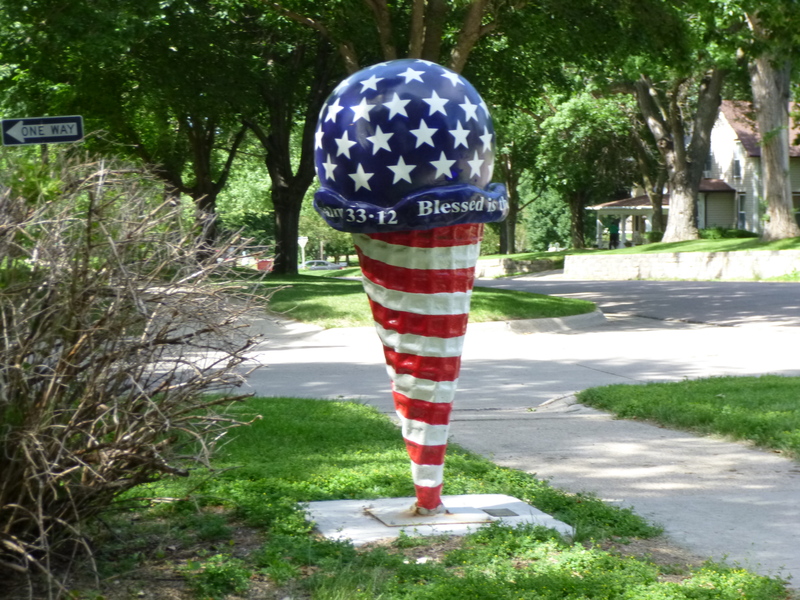 I had walked all 56 miles, and made all 7 donations – Friendly House, Lutheran Church Food Pantry, Nordic Dancers, Honor Flight, Miracles in Motion, Fresh Produce Program and Mobile Pantry Program. 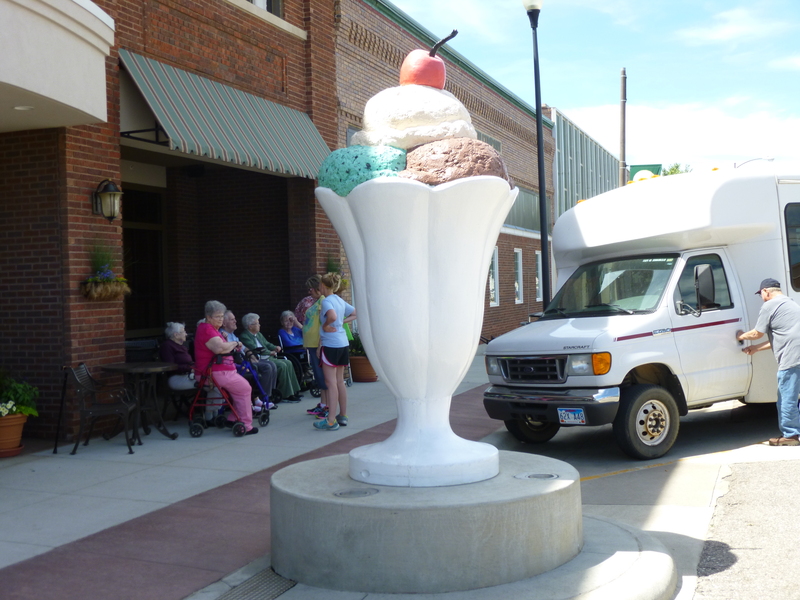 When I was done with everything, I made the drive back to Beresford, and spent a little time with Sandra as she was sorting through my aunt’s house, and then had a quick bite to eat with her and Jay. We then went to visit my Aunt Gloria in the local nursing home, and it was a real good visit. Like many patients there, there are good days and bad, and she was having a good day, so that was a fun way to end my full day. Then I spent the night at my dad’s house again. Tomorrow I’m off to State #39! This reader is still following you around the Midwest. Keep up the interesting writing!